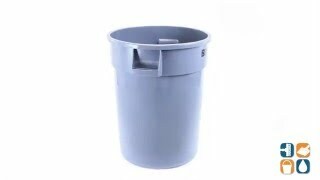 Convert your Rubbermaid 32 gallon trash can into an outdoor trash receptacle for a commercial or residential environment with Rubbermaid's Brute Trash Can Lid. Coming complete with a strong, snap-on lid feature that fits securely on the can, this can lid is perfect for the outdoors. Comprised of an all-plastic, professional-grade formula that will not rust, chip or peel, and it resists dents. A reinforced rim and base set the standard for Rubbermaid quality. All colors are NSF/USDA Approved for food contact and NSF tested/certified. Manufactured by Rubbermaid Commercial Products. Lid fits 32 Gallon Brute Round Trash Can, sold separately (RCP 2632). Dimensions: 22.4"D x 1.9"H.
It does what exactly I thought it would and fit perfect.